Because I’m overly ambitious, I made these snacks for our Girl Scout troop meeting the other day. Gotta have fuel for our feminist agenda! Or, to talk about friendship and stuff. 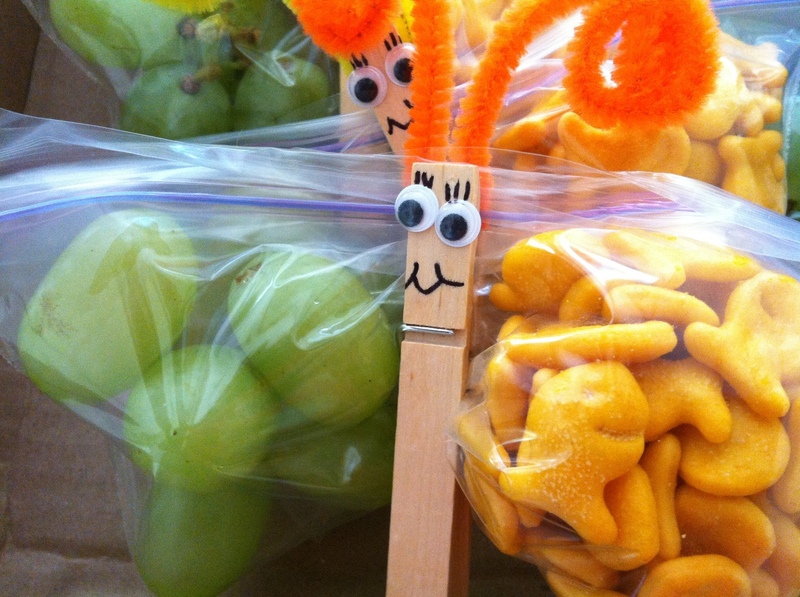 I found these on Pinterest from a post on Juggling with Kids (a site I just got lost on ala Pinterest– so many great ideas, especially for preschoolers! 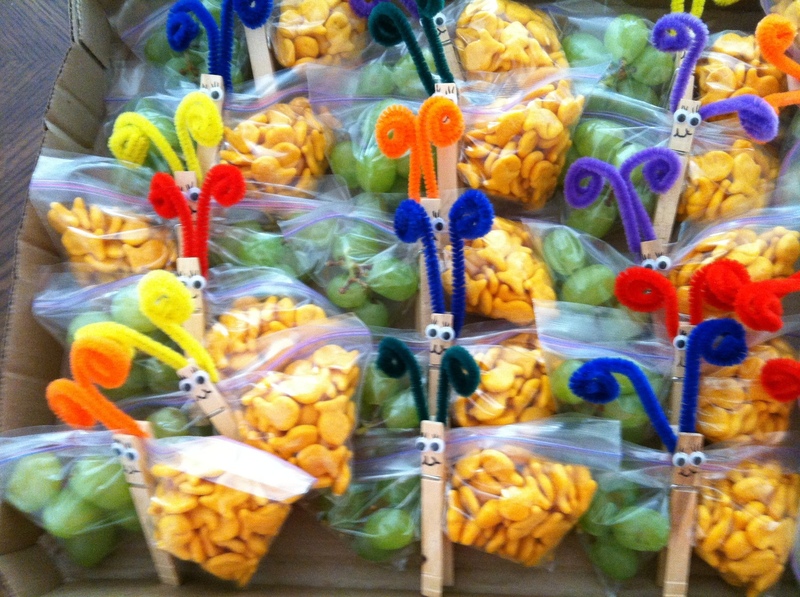 I want to make the pumpkin play doh even though my kids don’t really play with it anymore) of course, and thought, hmmm, I have grapes, I have Goldfish, I have Googly eyes, I have clothespins and snack bags…I can totally do this! It does take some time, I found out. I might have a particular special problem, but everything I do seems to take a lot longer than it says it will. For example, if a recipe says “30 min prep, 20 minute cook,” it will probably take me twice that time. The snacks also want to slip from one end to the other. Goldfish, stay on your side! Yep, it might just be me. I have friends who whip up crafts and recipes like it’s going out of style. It takes me 110% of all my concentration and smoke comes out of my ears. Martha Stewart I’m not. Also, I have a problem with Ziploc bags, i.e. they won’t zip properly for me. Cadillac says this is because I don’t run my fingers along the length, but rather snap-snap-snap, if you know what I mean. He was so concerned about these that when he got home from work, he double checked all of them. Anyway, they turned out super cute, and the girls loved them! Little Girl was SO PROUD to pass them out to her friends, it was totally worth it. Glue the eyes to the clothespin. Fold a pipe cleaner in half and curl the ends. I curled them around a pencil, to make it faster. Fill each half of the baggie with the snacks. Zip closed. Clip the clothespin up the middle, forming wings on either side. Clip the pipe cleaner as antennae. TIPS: I made sure those grapes were obsessively dried off after I washed them, because I was afraid the moisture would leak over the cracker side overnight and make them soggy. I also used a Sharpie to draw the mouths and eyelashes, ’cause these are girls. Do you mean glue the eyes to the CLOTHESPIN?? 🙂 These are super cute! Bet the kiddos loved them!